Williamsburg is an independent city located on the Virginia Peninsula in the Hampton Roads metropolitan area of Virginia, USA. As of the 2010 Census, the city had an estimated population of 14,068. It is bordered by James City County and York County, and is an independent city. The Bureau of Economic Analysis combines the city of Williamsburg with James City County for statistical purposes. The Historic Triangle of Virginia, which also includes Jamestown and Yorktown, is among the most popular tourist destinations in the world, with Williamsburg located in the center. The three are linked by the National Park Service's Colonial Parkway, a 23-mile (37 km)-long National Scenic Byway which is carefully shielded from views of commercial development. The toll-free Jamestown Ferry is located at the southern end of the Colonial Parkway. State Route 5, another scenic byway, links Williamsburg and Richmond. Most highway travelers reach Williamsburg via nearby Interstate 64, U.S. Route 60, and State Route 143, each major east-west highways. Commercial airline service is available at Newport News/Williamsburg International Airport (20 miles), and at Richmond and Norfolk airports (both 55 miles (89 km) away). All are located along I-64 and offer limousine service to Williamsburg, as well as rental cars. 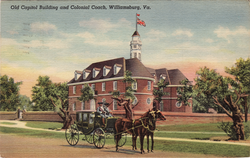 Williamsburg also offers public transportation alternatives for visitors and citizens. 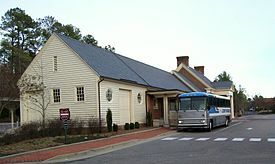 The intermodal Williamsburg Transportation Center is located in a restored Chesapeake and Ohio Railway station near the Historic Area, downtown, and the College. It offers Amtrak and Greyhound services, taxicabs, and rental cars. There, many visitors transfer to the community's local transit bus system, Williamsburg Area Transport, which operates accessible equipment for the mobility-impaired with bicycle racks on buses as well. Lying along the center-line of the Virginia Peninsula, the location which became Williamsburg was some distance from both the James River and the York River, the ground sloping down to the shore of each. Near Williamsburg, College Creek and Queen's Creek each fed into one of the two rivers. Between these two creeks the land area was only about 6 miles (9.7 km) wide, much less than at other points. Jamestown was the original capital of Virginia Colony, but was burned down during the events of Bacon's Rebellion in 1676. As soon as Governor William Berkeley regained control, temporary headquarters for the government to function were established about 12 miles (19 km) away on the high ground at Middle Plantation, whilst the Statehouse at Jamestown was rebuilt. The members of the House of Burgesses discovered that the 'temporary' location was both safer and more pleasant environmentally than Jamestown, which was humid and plagued with mosquitoes. Goodwin dreamed of a much larger restoration along the lines of what he had accomplished with his historic church. A cleric of modest means, he sought support and financing from a number of sources before successfully attracting the interest and major financial support of Standard Oil heir and philanthropist John D. Rockefeller, Jr. and his wife Abby Aldrich Rockefeller. 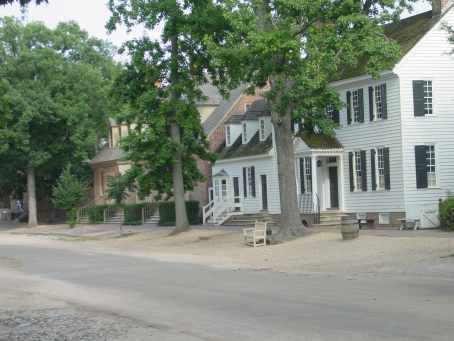 Their combined efforts created Colonial Williamsburg, involving restoration of much of the downtown Williamsburg area and the creation of a 301-acre (1.218 km2) Historic Area, celebrating the patriots and the early history of America. The third of three debates between Republican President Gerald Ford and Democratic challenger Jimmy Carter was held at Phi Beta Kappa Memorial Hall at The College of William & Mary on October 22, 1976. Perhaps in tribute to the debate’s historic venue, as well as to the United States Bicentennial celebration, both candidates spoke of a "new spirit" in America. On May 3, 2007 England's Queen Elizabeth II visited Jamestown and Williamsburg, Va. Her last visit to Williamsburg was in 1957. The city is located on the I-64 corridor on the Virginia Peninsula, 45 miles (72 km) southeast of Richmond and approximately 37 miles (60 km) northwest of Norfolk. It is in the northwest corner of the greater Hampton Roads area, (officially known as the Virginia Beach-Norfolk-Newport News, VA-NC MSA), which is the 34th largest in the United States, with a total population of 1,576,370. The area includes the Virginia cities of Norfolk, Virginia Beach, Chesapeake, Hampton, Newport News, Poquoson, Portsmouth, Suffolk, Williamsburg, and the counties of Gloucester, Isle of Wight, James City, Mathews, Surry, and York, as well as the North Carolina county of Currituck. While Virginia Beach is the most populated city within Hampton Roads, it currently functions more as a suburb. The city of Norfolk is recognized as the central business district, while the Virginia Beach seaside resort district and Williamsburg are primarily centers of tourism. Williamsburg's mild four season climate means outdoor activities can be enjoyed year round. The weather in Williamsburg is temperate and seasonal. Summers are hot and humid with cool evenings. The mean annual temperature is 60 °F (16 °C), with an average annual snowfall of 6 inches (150 mm) and an average annual rainfall of 47 inches (1,200 mm). No measurable snow fell in 1999. The wettest seasons are the spring and summer, although rainfall is fairly constant all year round. The highest recorded temperature was 107.0 °F (41.7 °C) on July 7, 2010, July 24, 2010 and July 25, 2010. The lowest recorded temperature was −7 °F (−22 °C) on January 21, 1985. As of the census of 2010, there are 14,068 people, 3,619 households, and 1,787 families residing in the city. The population density is 1,404.1 people per square mile (542.4/km²). There are 3,880 housing units at an average density of 454.1 per square mile (175.4/km²). The racial makeup of the city is 74.0% White, 14.0% Black or African American, 0.3% Native American, 5.7% Asian, 0.0% Pacific Islander, 2.5% from other races, and 3.5% from two or more races. 6.7% of the population are Hispanic or Latino of any race. As with most of Virginia (the Northern Virginia/Washington D.C. metro area being the notable exception), Williamsburg is most often associated with the larger American South. People who have grown up in the Hampton Roads area have a unique Tidewater accent which sounds different from a stereotypical Southern accent. Vowels have a longer pronunciation than in a regular southern accent. For example, "house" is pronounced "hoose" in the Tidewater accent. Other highlights in the city include The Williamsburg Winery (Virginia's largest winery), the Williamsburg Botanical Garden, and the National Center for State Courts. Also located in Williamsburg are two major theme parks, Busch Gardens Europe and Water Country USA, as well as Go-Karts Plus action park and 2 miniature golf courses. The 200-acre (0.81 km2) Williamsburg Pottery Factory shopping complex visited by 3 million people annually is located at nearby Lightfoot, Virginia. "Artistic" and ornamental items are sold at the Market Square shops adjacent to the colonial area, and at many stores on Richmond Road. President's Park is a new educational attraction displaying outdoor statue heads of all 43 Presidents, each one accompanied by a descriptive biographical plaque. It should be noted that the President's Park caused a stir in the local community when debate erupted over the "tastefulness" of the display. The dominant newspaper in Williamsburg is The Virginia Gazette. The Gazette is a bi-weekly, published in Williamsburg, and was the first newspaper to be published south of the Potomac River, starting in 1736. Its publisher was William Parks, who had similar ventures in Maryland. Federally, Williamsburg is part of Virginia's 1st congressional district, represented by Republican Rob Wittman, elected in 2007. As of 2010, the current Mayor of the city of Williamsburg is Clyde Haulman, and the Vice Mayor is Paul Freiling. Other members of the city council are Scott Foster (the first William and Mary student elected to city council), Douglas Pons, and Judith Knudson. The current city manager is Jackson C. Tuttle. The public school system is jointly operated by the city of Williamsburg and James City County. The Williamsburg-James City County Public Schools system (known informally as "WJCC") consists approximately 9,000 students in 14 schools—8 elementary schools, 3 middle schools, and 3 high schools. Within the county's boundaries, the two established high schools, Lafayette, and Jamestown, are considered above average institutions. A third high school, Warhill, opened in the Lightfoot area in August 2007. An eighth elementary school, named Matoaka Elementary School, also opened at that time. 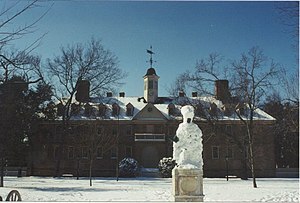 The city has also been the home to The College of William & Mary since its founding in 1693, making it America's second oldest college (behind Harvard University). Technically a university, William & Mary was also the first U.S. institution to have a Royal Charter, and the only one to have coat-of-arms from the College of Arms in London. The College campus closely adjoins the Historic District, and the Wren Building of the College at the head of Duke of Gloucester Street was one of the earliest restored by the efforts of Reverend Dr. W.A.R. Goodwin and the family of John D. Rockefeller Jr. as they began creating what is now commonly known as Colonial Williamsburg. Over 70% of the students of the College either work part-time or serve as volunteers in the community. Students contribute over 300,000 hours of volunteer service to the Williamsburg community annually. The primary airport for the Virginia Peninsula is the Newport News/Williamsburg International Airport in Newport News, a twenty-minute drive from Williamsburg. Norfolk International Airport and Richmond International Airport also serve passengers from the city. ^ "Newport News/Williamsburg International Airport: Location and Directions". Newport News/Williamsburg International Airport. http://www.nnwairport.com/airport-information/location-a-directionshttp://www.nnwairport.com/. Retrieved 2011-02-18. This page uses content from the English language Wikipedia. The original content was at Williamsburg, Virginia. The list of authors can be seen in the page history. As with this Familypedia wiki, the content of Wikipedia is available under the Creative Commons License.